DC Universe Animated Original Movies - JUSTICE LEAGUE: GODS AND MONSTERS | Warped Factor - Words in the Key of Geek. Matthew Kresal separates the gods from the monsters. They are icons of the comic book world. They are the DC Trinity: Batman, Superman and Wonder Woman. They are also the heart of the Justice League which helps to fight crime and defend against threats in the DC universe. But imagine they weren't the characters that we've come to know and love so well over the last few decades and instead were, say, the son of a corrupt and power hungry Kryptonian General Zod or a scientist turned into a vampire like creature or was Bekka instead of the Amazon Princess Diana. 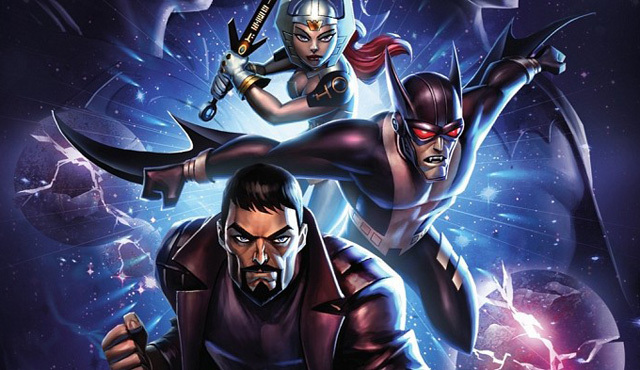 That premise, and the consequences of it, is the basis for Justice League: Gods And Monsters that was released last summer as part of the ongoing range of DC Universe Animated Original Movies. Does it live up to its premise? The premise is certainly an interesting one that readers of DC 's Elseworld range of stories will recognize as a classic “what if?” straight out of that line. Turning Superman into the son of General Zod who instead crash lands in Mexico to be raised by Mexican migrants is an inspired move, and one which gives this incarnation quite a different feel from the Clark Kent character. Batman and Wonder Woman's characters here are inversions of existing DC characters such as Man-Bat and Bekka. Indeed much of the film centers on the inversion of many DC characters whom fans will likely recognize, such as Lois Lane, Lex Luthor, Ray Palmer, Victor Stone and Will Magnus, but that won't alienate newer viewers and makes Gods And Monsters perhaps the most original release that the range has given us in sometime. Though what it does with the premise is perhaps less original. One of the things I have taken away from the range in the last couple of years has been the emphasis on action sequences over good storytelling, particularly in Justice League: War and the films based on The New 52 comics, something which began to happen once Bruce Timm walked away from the range. With Timm returning, one had hoped that the emphasis might shift back. Sadly it doesn't quite make it with the result being that the intriguing premise is largely boiled down into a series of fairly stale action sequences that seem to have been recycled from a number of previous DC animated projects. Which is a shame really. Even more so due to a good voice cast. DC's animated efforts from Batman: The Animated Series onwards have always featured strong voice acting and this film is no exception. The three leads are all well cast for their particular takes on the role, from Michael C. Hall as Batman, Benjamin Bratt as Superman, Tamara Taylor as Wonder Woman, with Hall and Taylor in particular being inspired choices. The supporting cast is strong as well, including an underused Jason Isaacs as Lex Luthor, Paget Brewster as Lois Lane, and C. Thomas Howell as Will Magnus. As with many of the recent films, it's a shame that they couldn't be put to use in a better overall work. At the end of the day, Gods And Monsters can be summed up like this: an interesting premise with a less than worthy execution. Despite an interesting premise that harkens back to some of DC's best Elseworlds tales and the inspired casting, the film comes across as little more than yet another excuse for a DC animated release with more action sequences than plot. It's a trend that, with the exception of the announced adaptation of The Killing Joke, looks firmly set to continue.